You have enormous potential. Your obligation is to develop your skills to achieve it. Aquire 10 Critical Skills To Grow Your Business in 2019! 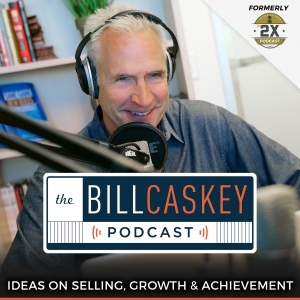 Bill Caskey writes books, records podcasts and produces videos with one intent: help sales teams move from ordinary to extraordinary. The market has changed dramatically, which demands you prospect and sell differently in order to succeed. Those who change their mindset and mechanics can “own” their market. Bill proves that by abandoning the worn out sales approaches that prospects see coming a mile away, you can radically increase your income. It requires that you develop and implement a scalable plan, think differently, and take new and different actions. Bill helps clients do just that. He has trained sales teams for 30 years, taught over 7500 workshops, and coached over 50,000 sales professionals. He’s the author of Same Game New Rules used by hundreds of sales teams (and several other titles); creator of The 2X Group, a mastermind learning program for high sales achievers; and co-host of The Advanced Selling Podcast, a Top 30 Business Podcast on iTunes with over a million downloads and according to Inc. is one of the “19 Podcasts Worth More Than an MBA;” and host of the 2X Podcast: High Impact Sales Training for Sellers and Leaders. A weekly deep look into usable and effective strategies and mindsets to help sellers and leaders become unstoppable in their market. Bill provides guest experts, downloadable cheat sheets and powerful content to guide you on the journey to sales mastery. A Top 50 Business Podcast, Bill and Bryan discuss working with sales teams and they answer questions from listeners. They share strategies, frameworks, tips and tricks to help you leverage your talent, grow your skills and create your own sales success. Bill has helped me craft better messages, and develop a process for my prospects to follow. I’m now a Guide for my clients and help solve their problems more quickly and more effectively. I’ve followed Bill for a few years but recently joined his mastermind group. The biggest benefit is that Bill has given me a very simple skill called “Clarity.” I believe I now have a more effective selling philosophy because I am crystal clear about what needs to happen in my sales process. The result is that I can identify those prospects who are good ones and those that aren’t. It saves me tons of time in my pursuit of new business. I’ve been a client of Bill’s for nearly two years and I get a lot of value out of his training. My sales process has completely changed and I now have more truthful conversations with my prospects. This has made a dramatic improvement in my closing percentage! Want to stay up to date on our latest products? Sign up for our newsletter now! Episode #540: Are You Able To Scale Your Business and Are You Persuasive?